I recently asked my sister, a successful realtor, what the one thing is that she has the most difficulty explaining to people when selling their homes. She said it’s getting them to accept the fact that much of the money they spent on improvements over the years didn’t do very much to increase their home’s value. So on that note, here are eight home improvements that can add big value to your house while doing little damage to your wallet. The difference between a bedroom and a sewing room (or den or home office) is very simple: a closet. Adding a closet to any room with a door turns it into a bedroom and can add thousands to the value of your home. All it takes is some framing lumber and drywall along with basic carpentry skills and you’re good to go. Bedrooms are among the best ways to increase the value of a house, and converting all or part of your attic to a bedroom is a sound investment–one that, on average, returns about 75% of its cost when it comes time to sell. Growing up in a family with four children and one bathroom, I learned early that not only does everyone have to go, but they often have to go at the same time. That’s why adding a half bath to your home can up its value by as much as 10 percent. And a full bath can boost your value by up to 20%. Front door makeovers can range from a fresh coat of paint to new hardware and fancy knocker to even an entirely new entryway. 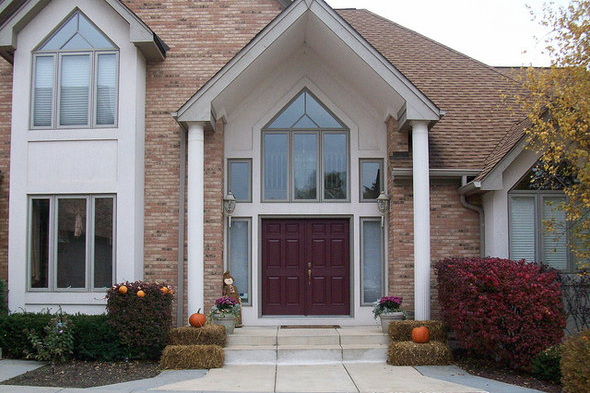 Front doors take a beating over time because they’re constantly exposed to the elements and lots of physical abuse. Refurbishing your entryway will help make a great first impression on guests and potential buyers and will easily pay for itself in most cases. Aging celebrities will tell you that while you can’t always change the product, you can sure fix the packaging. Face lifts are not only for those getting older; they’re also for kitchens. Rather than going whole hog on a complete kitchen remodel, though, you can consider refacing cabinets by either refinishing existing doors or getting brand new ones at a fraction of the cost. The same is true for mismatched and dinged-up appliances. Replacing boring laminate counter tops with solid granite can be expensive and not always recoverable in terms of adding value. A less expensive and more cost-effective alternative may be granite overlays. By using half-inch thick granite with sides attached that fit over your existing countertops, you can have a counter that looks like solid granite at about half the cost. Floors are one of the most overlooked parts of the home, and refinishing scuffed-up or scratched hardwood floors will dramatically improve the look of any space. If you laid carpet over beat-up hardwood when you purchased your house and the carpet has seen better days, ripping it out and refinishing the hardwood underneath is less expensive than putting down new carpet. The least expensive and most cost-effective way to boost the value of your house is to paint it. A fresh coat of a neutral-colored paint will brighten your entire house and make everything look cleaner, neater and bigger. Budget with your potential return on investment in mind. You don’t want to lose a lot of money on a home improvements, especially if you’re making these improvements just to sell. Talk to a financial planner. Home improvement projects aren’t cheap, and you want to ensure it won’t affect your financial plan. A matching tool like SmartAsset’s SmartAdvisor can help you find a person to work with to meet your needs. First you’ll answer a series of questions about your situation and goals. Then the program will narrow down your options from thousands of advisors to three fiduciaries who suit your needs. You can then read their profiles to learn more about them, interview them on the phone or in person and choose who to work with in the future. This allows you to find a good fit while the program does much of the hard work for you.